Dont throw away those turnip greens! They are exceptionally rich in phytochemicals, vitamin A, and are also an excellent source of vitamins C and Eall powerful antioxidants. Fill a large bowl with fresh, cool water and swish the greens around gently until they are free of sand and dirt. Remove greens, empty bowl, and repeat, just to be sure theyre clean. Pat greens dry with a clean kitchen towel. About 10 minutes before serving dinner, heat a tablespoon (15 mL) of butter in a small frying pan or wok. Saut?reens (add green onions or chives and minced garlic if desired) for about 5 minutes. For additional taste, nutrition, and presentation flair, sprinkle toasted sesame seeds on top. The calorie count on turnips is a little bit of good news. Nutritional estimates show that a 1 cup serving of turnips and turnip greens has just 57 calories and only 1 gram of fat. Thats a pretty low number when you think about all of the rest of the stuff that goes into your daily diet. Its not just a low calorie count that turns people on to the health benefits of turnips. The same serving of this vegetable contains 8 g of carbohydrates, 5 g of dietary fiber and another 5 g of protein. That makes the turnip a good choice for powering up while avoiding a lot of the stuff that often comes with these essential nutritional elements. Theres just 2 grams of natural sugars in the 1 cup serving, and only 31 mg of sodium. That makes turnips a very healthy choice overall. When it comes to essential vitamins and minerals, there is a laundry list of stuff found in turnips that will dazzle healthminded food shoppers. Theres plenty of vitamins A and C, as well as a bit of vitamin E and an astonishing amount of vitamin K, an element handy in blood coagulation. The vitamin K levels are actually one thing that dieters should be aware of with this food, as some existing medical conditions can require avoiding extreme vitamin levels. If youre sensitive to coagulants or on blood thinners, talk to your doctor about weighing the benefits if introducing turnips or similar foods to your plate. Turnips have a little bit of almost everything, including thiamin, riboflavin and folate, an important nutritional element for pregnant women and others. With all of this great stuff included in turnips, its worth thinking about how to integrate this vegetable into your meals. Turnips can be prepared in many different ways. Classically, they have been part of soups and some Eastern Eauropean or Russian entrees. Some modern cooks like to experiment with different uses of turnips, including a mashed dish or as a component in exotic items like shepherds pie, a UK favorite. There is evidence that the turnip was domesticated before the 15th century BC; it was grown in India at this time for its oilbearing seeds. 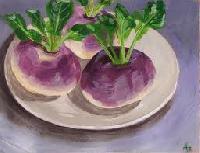 The turnip was a wellestablished crop in Hellenistic and Roman times, which leads to the assumption that it was brought into cultivation earlier. Sappho, a Greek poet from the 7th century BC, calls one of her paramours Gong?la, turnip. Zohary and Hopf note, however, there are almost no archaeological records available to help determine its earlier history and domestication. Wild forms of the hot turnip and its relatives the mustards and radishes are found over west Asia and Europe, suggesting their domestication took place somewhere in that area. However Zohary and Hopf conclude, Suggestions as to the origins of these plants are necessarily based on linguistic considerations. Pliny the Elder considered the turnip one of the most important vegetables of his day, rating it directly after cereals or at all events after the bean, since its utility surpasses that of any other plant. Pliny praised it as a source of fodder for farm animals, noting that this vegetable is not particular about the type of soil it grows in and that because it can be left in the ground until the next harvest it prevents the effects of famine for humans (N.H. 18.34). Turnips have antiinflammatory properties, so it helps to prevent the heart attack, strokes, blood clotting and various heart diseases. They also helps to lowering the LDL (Bad) Cholesterol level by increasing the HDL (Good) cholesterol level, thus providing cardiovascular health benefit. Turnip contains high value of potassium, which is beneficial for the fluid balance and keeps blood pressure maintain. It also hold some amount of calcium, which is beneficial for bones and teeth health. It also contains small amount of zinc, iron, selenium, manganese, magnesium, sodium and phosphorus which also hosts many health benefits.